For the new year I wanted a new series I could post every Sunday, something that was a little different and I hadn't seen done before. Like myself you might spend ages trying to find new blogs to read so I decided to hand pick a few of my favourite bloggers that I think are a little underrated in the beauty/fashion/lifestyle blogosphere world. In my opinion they all deserve an extra few readers and what better way to know them then a few questions of what you can expect. So here we have 'Meet the Blogger'. "Hi everyone I'm Lauren! 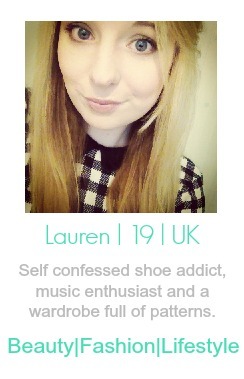 I blog over at Lauren Wanders. Its a lifestyle blog where I share my daily musings about beauty, fashion, food and take you with me on my travels." I started blogging a fair few years ago but not consistently, then last year I decided I wanted to start afresh after being inspired by so many lifestyle blogs, especially The Londoner's blog. Mascara always, I have repurchased Maybelline's The Falsies mascara for about a year now. I don't really have a particular person as so many things inspire my style both fashion and makeup wise. It can be from scrolling through my Tumblr feed, to watching some of my favourite Youtubers, to reading style blogs and magazines. I adore so many bloggers I could list so many, but at the moment its definitely Suzie from HelloOctober. Her Sunday post is my favourite and her Youtube videos are amazing. I would have to say Viva la Blonde's blog, she posts about beauty, food and fashion and definitely deserves more readers. Oo thats a toughie, it definitely used to be Revlon but nowadays its Maybelline. They have amazing mascaras and the colour sensational lipsticks are the best. I love the Fit Me foundation too. I think it's going to have to be Nars. I adore the Laguna bronzer and the blusher range is gorgeous. I would love to try their lip pencils too, having read great things about them. Zara get it right every time for me, followed closely by Topshop. Be yourself. I know its an obvious one but I love reading blogs where you feel as if you know the person behind the screen. Also don't blog for the sake of blogging as it just doesn't work. Only write when you really want to as the content is always better. My favourite electrical beauty product is the Babyliss Soft Waves Curling wand, it gives my hair soft loose curls which I definitely prefer at the moment. In terms of products I only use my Batiste Dry Shampoo to give my hair a bit of volume, but I'm still meaning to try the Oribe Dry Texturing Spray. My blog is my online diary, I want to carry on posting snippets from my life and share my memories, so I can look at back at them and remember that time in my life. Along the way I would love to make some 'blogger' friends as they share the same passion and hobby as me and hopefully increase my readership and interact with every single one of them. I hope you all enjoyed the first instalment of 'Meet the Blogger' and make sure to check Lauren's lovely blog out and her Youtube channel is fab too. And if you want to get involved in this series then just click on my contact page to email me your interest.